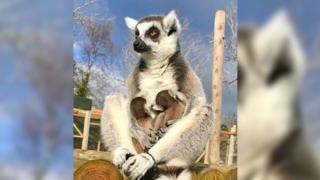 A ring-tailed lemur has given birth to twins at an Isle of Man wildlife park. The new arrivals, which have not yet been given names, were born to mother Acorn. Known for their black and white striped tails, the animals are indigenous to Madagascar and classified as endangered by the International Union for Conservation of Nature. Curraghs Wildlife Park manager Kathleen Graham said in the last 15 years numbers in the wild had fallen by 90%. Mrs Graham said: "People tend to think they are doing well as they see them in zoos, but they are bordering on being classed as critically endangered." The one-week-old duo have been seen clinging to their mothers' belly but will soon become more independent and begin exploring their surroundings. The species is under threat due to a decline of its forest habitat.